Secretary-General António Guterres (left) at the 16th meeting of the United Nations Counter-Terrorism Centre Advisory Board in Riyadh, Saudi Arabia. 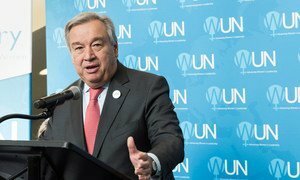 “First, we need a sustained focus on prevention,” said Secretary-General António Guterres at an advisory board meeting of the UN Counter-Terrorism Centre (UNCCT), held in Riyadh, Saudi Arabia. Second, Mr. Guterres said, UNCCT should continue to meet the changing needs of Member States for counter-terrorism capacity-building support. UNCCT is the capacity-building part of the UN Office of Counter Terrorism (UNOCT), which is headed by Mr. Voronkov, who is also UNCCT’s Executive Director. UNCCT was established in 2011. Saudi Arabia, with a donation of $110 million, is the largest contributor to the UN Trust Fund for Counter-Terrorism, which resources UNCCT. Since April 2012, UNCCT has implemented more than 60 capacity-building projects at global, regional and national levels. It focuses its activities on countries and regions where the threat of terrorism is most acute, particularly in Africa, the Middle East, and Central and South Asia. Meanwhile, the UN Office of Counter Terrorism signed an agreement with the Interior Ministers Council of the League of Arab States on Tuesday on working together to tackle terrorism – previewing the type of partnerships the UN hopes to forge in June at a gathering of counter-terrorism chiefs in New York. “We have much to learn from each other,” UN Under-Secretary-General for Counter-Terrorism, Vladimir Voronkov, said in Riyadh after the signing of the agreement, known as a Memorandum of Understanding, between his office and the General Secretariat of the Arab Interior Ministers Council. “In the Memorandum, we declare our wish to coordinate our activities with a view to achieving our shared counter-terrorism goals. We commit each other to enhance consultations, coordination and the sharing of information and skills,” he explained. The two organizations will develop joint activities, such as seminars, workshops, trainings, projects and other initiatives, to build the capacity of members of the Arab League in the fields of counter-terrorism and prevention of violent extremism. Secretary-General António Guterres (right) is greeted upon arrival at the King Salman Humanitarian Centre in Riyadh, Saudi Arabia. While in the Saudi capital, the UN Secretary-General met with King Salman bin Abdulaziz al Saud, Custodian of the Two Holy Mosques and King of the Kingdom of Saudi Arabia and discussed several issues of mutual concern, including the Middle East peace process. In that connection, he thanked the King for the country’s contribution to support the UN Relief and Works Agency for Palestine Refugees in the Near East (UNRWA), and also for his contribution to Yemen’s Humanitarian Response Plan. The Secretary-General also thanked Saudi Arabia for its financial and political support for United Nations counter-terrorism efforts, and for hosting the UNCCT advisory board meeting.